Watch my step by step guide here on YouTube. After leaving Koh Chang, I headed to Bangkok and chose to study thai massage at the world renown Wat Pho massage school. The #1 reason I chose this place instead of other schools in Chiang Mai is due to their deep rooted history and their accreditation. Wat Pho is the birthplace of Thai Massage. Thai massage is said to have come from, or rather, inspired by the yogic asanas and Ayuvedic principles from India – which is why I have interest in Thai Massage. It is not relaxing form of massage, at times it can be slightly uncomfortable. It focuses more on the acupressure points of the body to form to release muscle tension or pain. Wat Po was 1 of the 3 schools listed in Bangkok as being accredited with the National Health Practitioners of Canada (NHPC). One of other schools was Phussapa Thai Massage running fix course schedules from Monday – Friday, 9 a.m. – 4 p.m., alternate weeks. I like Phussapa and being Japanese-run, I think it would have had a more efficient way of running things, but it was more expensive at 12,000 baht, compared to Wat Pho at 9,500 baht. The other accredited schools were mostly in Chiang Mai with prices from around 6,000 baht and up, Sunshine being one of the top choices. Check if your school is accredited with NHPC. Additional reasons why I chose Wat Pho were based on schedule flexibility. 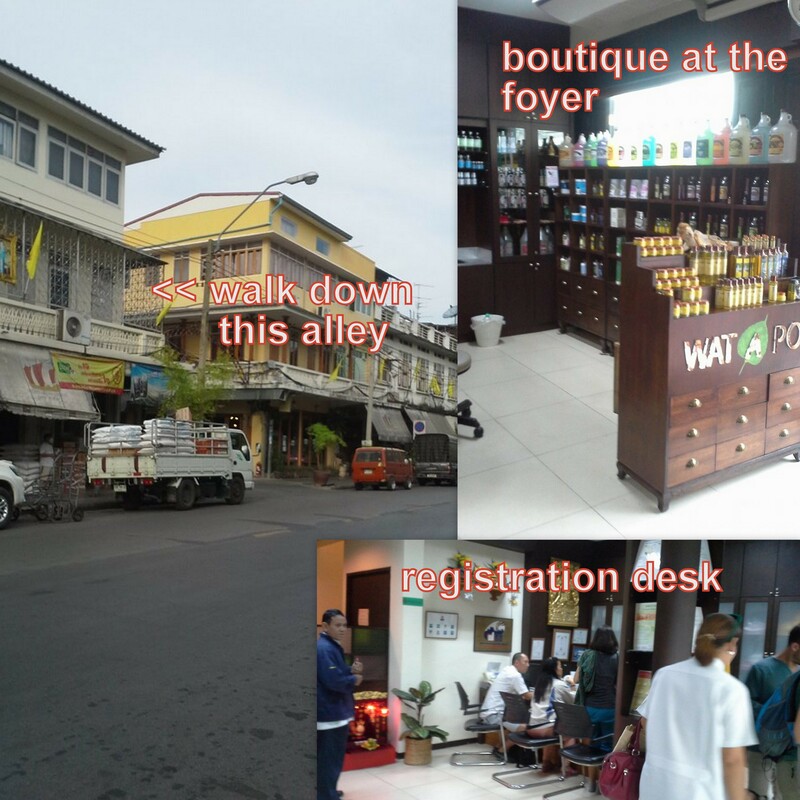 They have courses for General Thai Massage every single day 9-4, you just show up at 8:30 in the morning, register and pay. I found hostel accommodation on Samsen 2 (near Khaosan Road) called Glory Hostel for about 200 baht a night and it cost merely 7 baht/day for my bus ride to and fro Wat Pho on Bus 53. The hostel was clean and tidy, albeit a little cramped as most hostels in Khaosan are, but the staff were super friendly and helpful. It is within walking distance to Wat Pho too, if you would like to stroll about 30 minutes each day. 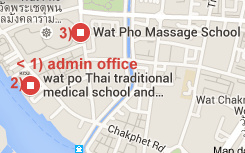 So recently, as of November 2015, I realized during my research that the location of the massage school was quite ambiguous, with Google Maps showing 2 locations. And I know people have been going there for years and locals will just give you instructions on how to get there. But let’s put a map to it. Basically, you will first have to go to the (1) administration office to first to get registered. It’s right down the alley where the yellow building is. You’ll need 3 passport sized photos – if you don’t have the photos right away they can be taken later by the 7-Eleven close by for 200 baht and they give you 12 photos! Once you are all registered, they will send you upstairs for “orientation” which is basically watching a video that explains the origin of Thai Massage. In the afternoon, you will move buildings down the street (2) at where the rest of your course will be held. Reusi Dat Ton classes at the eastern of the temple grounds in front of the massage parlour is (3) every morning 8 – 8:30 then followed by my own gentle yoga practice. It is open to public and I practiced here every morning. My overall experience was pretty good. I like learning and that’s key to any experience I believe. There are no real bad experiences, only lessons to be learned. I also met a really cool Japanese guy living in America who had a sense of humour and made the experience a fun one. The only complain I have is that our main teacher well wasn’t very interested in her job. On Day 1, a girl from my group that talked to much decided to ask for private lessons at her 5-star hotel. And thus, favouritism began in the class. Also, our teacher played with her telephone more than the others and had visitors throughout the day coming in to do business with her. I believe it was some sort of furniture building business because a guy came in one day with measurements of tables and handed her money. She left it up to other teachers to step in to show us the techniques in a more professional manner. If you are picky about teachers like I am, you can request for Pi Thip (the one I liked best) or the Indian Thai lady teach whose name escapes me. Request to start on the day that they start teaching Day 1, then they will be your main teacher for the rest of the course.